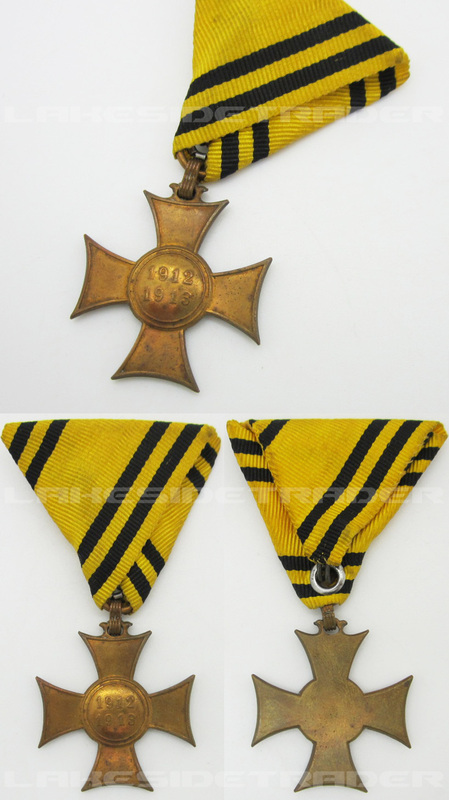 Here we have an Austria-Hungary Balkin Wars Commemorative Cross for Mobilisation. It was awarded to all military personnel, the service at least four weeks in a mobilized unit on the occasion of the Balkan crisis. It is constructed out of a die struck bronze base that has been bronze washed. The obverse features a Tatzenkreuz style cross with a centrally placed “1912 1913”. The reverse shows a full back. To the top is an integral loop and two connecting rings which are attached to a triangular folded (Austrian style) yellow and black rayon ribbon. The cross measures approximately 1 3/8 inches wide and tall. Neat piece!